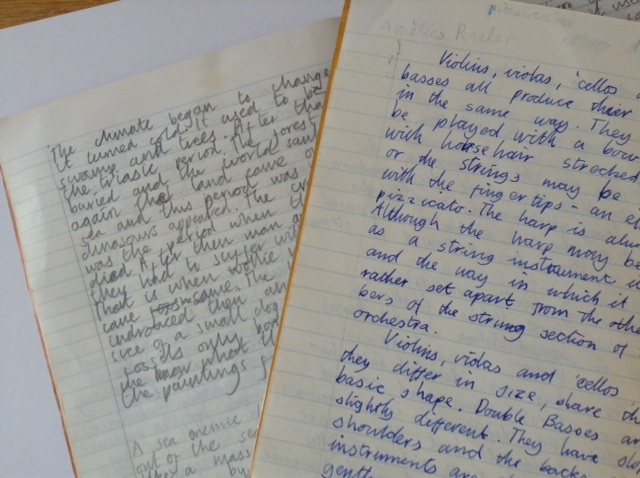 To me, the value of teaching children to write is undisputed; it is a skill that everyone should acquire. Whether they do it well, and their handwriting is a thing of beauty, is not essential – as long as it’s legible – in the same way that most can sing or shuffle a bit but not everyone can be a singing star or a champion at dancing. 1. Encourage children to write, it doesn’t matter what, as long as they get something on paper. 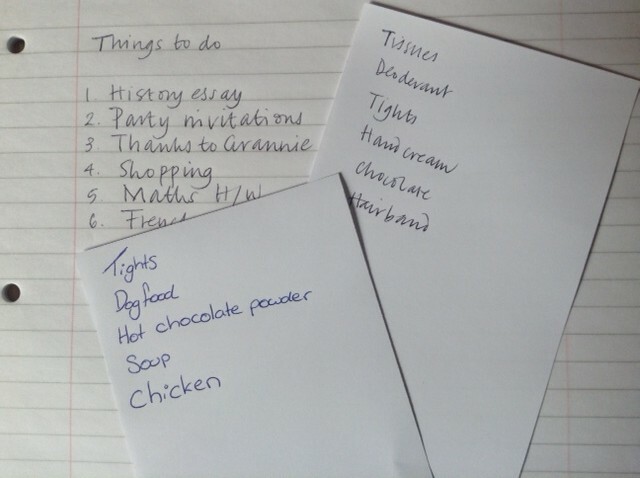 Suggest they keep a holiday diary, draw and write captions perhaps instead of thank you letters (which can be rather a chore), write letters to Father Christmas, and let you know, in writing, what they want for birthdays and special events. 2. 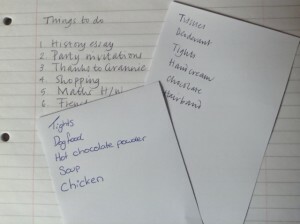 At the same time, let them see you writing a lot – making to-do lists, writing thank you cards and letters, adding a personal note to birthday cards rather than just ‘best wishes’, writing your own diary perhaps, writing shopping lists. And the worse thing adults can say to children? ‘My handwriting’s awful’ because the message of that is that you have got to where you are as an adult with rubbish writing, and so good handwriting doesn’t matter. 3. 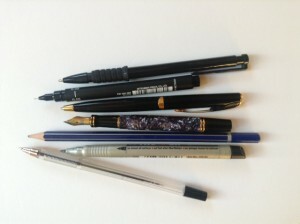 Get hold of a selection a pens and pencils and let them try them out to see what suits. 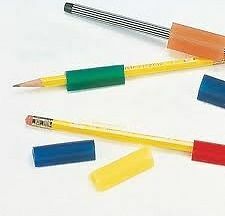 Some prefer big chunky pens and pencils, others slim light ones. 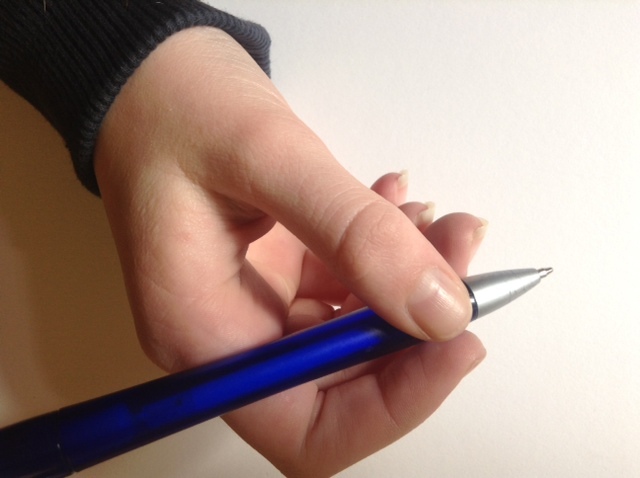 Insistance on using a fountain pen by carers or schools is, in my opinion, not fair. 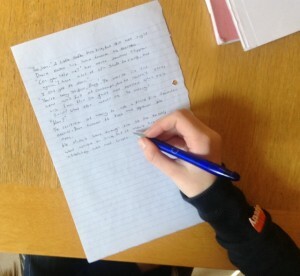 There are some children, often young boys, who manage to get themselves and their paper covered in ink just by taking the tops of their pens. For these never to achieve a nice piece of writing because wet ink and posh nibs are de rigeur isn’t going to help them feel good about writing. 4. Ensure they have somewhere suitable to write. Adult-sized tables and chairs for young children can cause pain if they have to reach up, and they won’t want to write if that’s a consequence. So a chair of the height whereby they can sit comfortably with their feet firmly flat on the floor, and a table which isn’t so low that they have to crouch over, or too high so they have to stretch would be ideal. 5. Arrange an appropriate light. Much of the ‘mood lighting’ in houses nowadays means that children can find it difficult to write simply because they can’t see! and for left-handers, the light source should be on the right-hand side (the lamp would normally be a bit further away than shown on the right, but the picture looked a bit strange when I did that!). 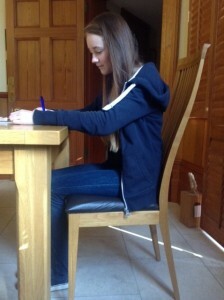 In daylight, simply turn the table and chair around by the window so this happens. 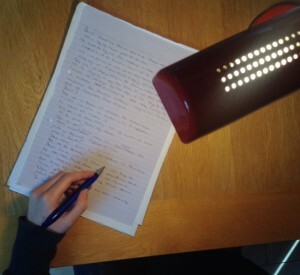 During the evening, a cheap table lamp will do the business. 6. And on the subject of right- and left-handers, to avoid left-handers having an ‘over-the-top’ grip, simply ensure that for them the left-hand corner of the top of the paper is highest. This is so easy, not at all rocket science, and it makes all the difference! 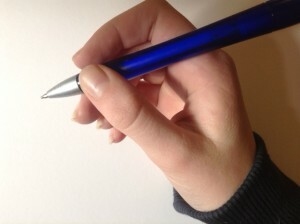 Left-handers often adopt the ‘over-the-top’ grip because when paper is placed in front of them with the top edge straight, they can’t see what they’re writing, and also smudge what they’ve written if using wet ink. Changing the paper angle by having the left-hand corner at the top resolves this. 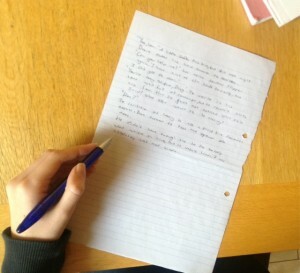 For right-handers the right-hand corner of the top of the paper should be highest. and then the control is given by the forefinger, which should be relaxed and not tense. 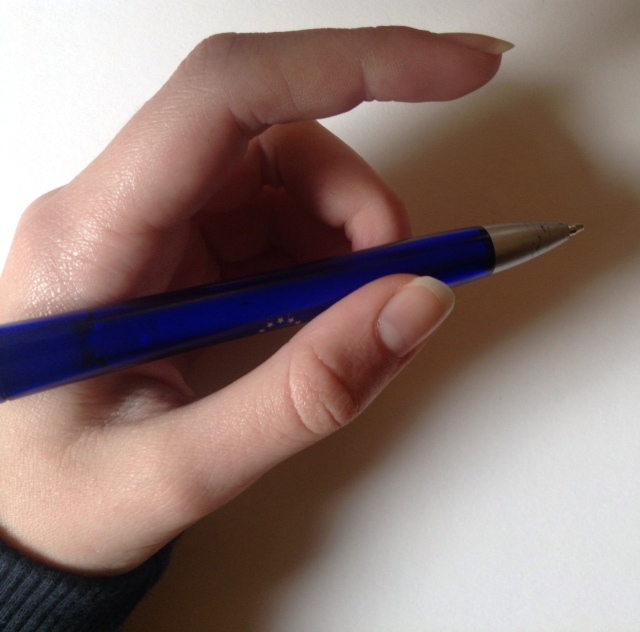 Left-handers might like to try to hold their pen or pencil a little further away from the tip, and rotate the hand slightly more to the left to help with seeing what they’ve written and to avoid smudging. 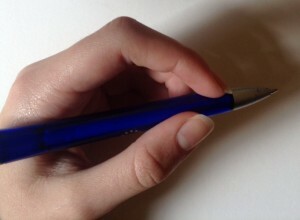 There are triangular grips which slide on to the pen or pencil, or even pencils that are themselves triangular, which help in maintaining this grip. 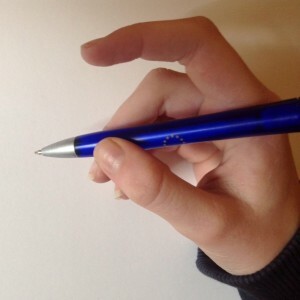 I wouldn’t like to condemn grips which are like a claw, or where the wrist is high, but they can cause tension in the hand, arm, shoulder and back when writing and that can lead to pain. Once handwriting is associated with pain, then why continue writing? 8. Encourage, encourage and encourage. Find one or two good letters well written and praise to the heavens on these, then suggest that if they can write those letters as well as that, then they can try to write others in the same letter families well, using the same or very similar strokes. Letter families are: Letters that start with a straight stroke and usually have a joining stroke or curve at the base – i,l,t,u,y,j. Letters that start with a downstroke and then arch (and beyond) – r,n,m,h,b,p,k (if using a looped, closed bowl style). Letters (most of – e is the exception) which start with a curve to the left – c,e,a,d,g,q,o. Diagonal letters (although depending on the lettering style, some of these may be more curved and fit in with the first letter family) – v,w,x,z. And then odds of f and s, and the letter k if the bowl isn’t closed as a loop. 9. People don’t expect to play a musical instrument well, or be able to do ballet without practising. It may be a chore but it gets results. 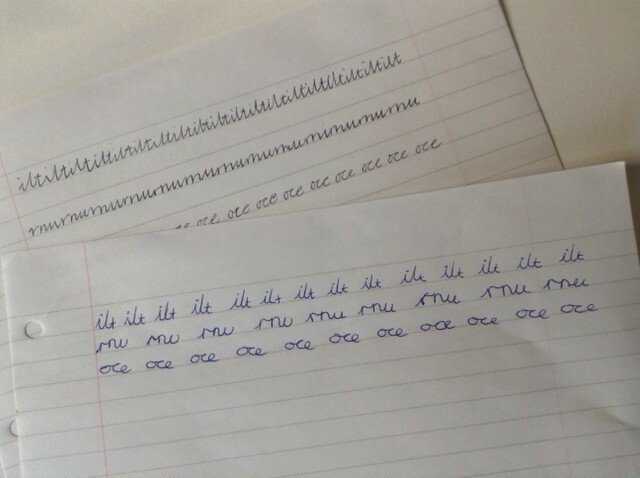 Some good exercises, on lined paper, once children have started to join up are repetitions of letters are i l and t, to get the heights right, then the letters r n and u to help with arches and joins; o c and e to help again with joins. And while encouraging children to do this, why not sit down and do it yourself at the same time to show that it’s important, as this will improve your writing too! 10. And the last isn’t a tip as such but a fact. Of course we all know that learning to write helps hand-eye co-ordination and encourages concentration and the ability to sit still for a period of time. In addition to this, research at Washington University concluded that children who are taught to write at a young age are better at composition and reading and also have better memories. They also found that children ‘wrote’ more quickly when hand-writing their compositions than when ‘writing’ them on a computer, even for those who had learned to touch type. 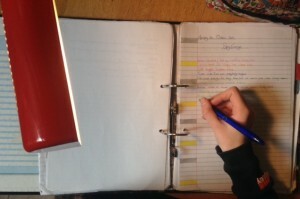 Many authors, too, find that handwriting allows ideas to flow more easily as the brain keeps up with the speed of the handwriter. What better proof then to emphasise the importance of everyone learning to handwrite and how much it helps children’s learning in so many other ways. So write letters to children (many children have never received a letter, let alone a hand-written one) and handwrite to thank people – everyone, not just children, likes to receive a letter and do e-mail thanks or phone calls really cut the mustard? Write every time you can – especially when children are around – and why not encourage your local school to enter the National Schools’ Handwriting Competition which is completely free and every child and adult (yes including caretakers, cooks, auxiliaries, TAs, helpers etc) in the school can enter? What better way to encourage everyone to value the importance and significance of handwriting? Many thanks to my hand model; she knows who she is! This entry was posted in Blog, Handwriting and tagged children, children's handwriting, grip for handwriting, handwriting, improving children's handwriting, left-handers, National Schools Handwriting Competition, paper position for writing, pens, right-handers, top ten tips for handwriting on 9 February 2014 by Patricia.